There could be any number of reasons why a page does not display. The most likely of any scenario we can come up with is a hiccup in the system. Every once in a great while when a server is asked a question it just spins and spins. Kind of like when you are asked a question and you know the answer is on the tip of your tongue, but you just can't get it out, same type of thing. And if the server takes too long to answer the website says, "oh bummer that page doesn't exist." And you get this sorry page. What causes the spinning? It could be any number of things, power surge, too many requests at once, you may have performed an action that simply has no response, the least likely scenario, but highly plausible, is gremlins. When the gremlins get into the machines, it's all over. Try again. If it truly was a hiccup, then the problem should resolve itself. If the problem persists you can submit a support ticket by clicking on this link: email support. If the problem is actually gremlins, we advise you to RUN! We feel bad that you've gotten this page. Regardless of the reason why you've landed on this page, we hate that your experience has been interrupted. 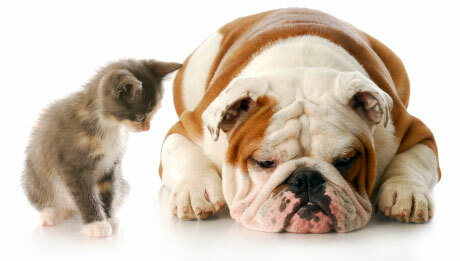 We hope this adorable photo of a puppy and kitten helps ease your stress of landing on this page. While we like to have fun, we take your success very seriously. If you continue to experience problems please call us at 800-566-4162. We are here to help! Your current subscription does not include VCG's Website Service. We'd love to build you a new website, risk-free. If you don't like it, you don't pay for it. Please contact us at (800) 566-4162 or send an email to ask about adding this service to your VCG subscription. Welcome to Visual Communications Group. You currently have a free profile on our Directory Network. To improve your position on our Directory Network, or to learn about VCG's powerful website and ecommerce tools, please contact us at (800) 566-4162 or send an email to ask about adding new services to your VCG subscription. We're sorry, but you're not an administrative user and don't have access to these services.